BREAKING point came for Chris Mayne about halfway through 2017. The newspapers were trashed, the social media applications were deleted and the talkback radio stations were switched off throughout the Mayne household. Such was the criticism of his form following a high-profile move from Fremantle, Mayne and his partner Britt decided enough was enough. It was time to forget the outside noise and focus on what was important – making the most of his time at Collingwood. The pair cancelled their summer holidays, instead opting to stay at home and decide upon a strategy for how the experienced mid-forward could once again become an AFL mainstay. 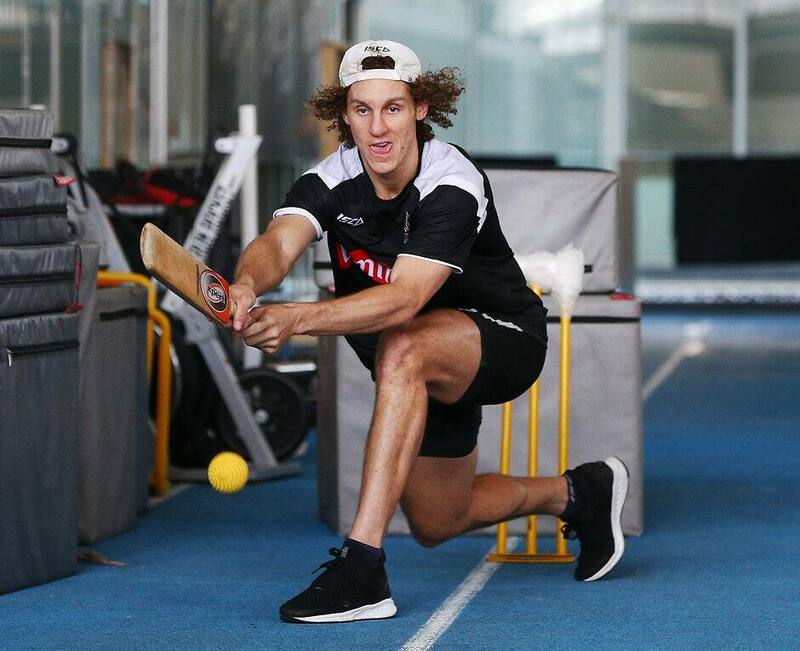 They put together a fitness plan, which combined with his vegan diet, put him in what he believed was the best possible position to reclaim his place in the Magpies team. It has paid dividends, with Mayne – much like Collingwood as a whole – defying external expectations in 2018. He has played 18 games so far this year, locking away a key role in a side that has returned to the finals for the first time in five years with a top-four finish. "When we got to the end of the year, it wasn't about keeping in that type of lull, it was about what I could do now," Mayne said. "That's what I wanted, I just wanted to be a part of success and play finals footy and have another crack at a premiership. I want to get the job done." After 172 games with Fremantle, Mayne managed just three in his first season with Collingwood, failing to return after he was unceremoniously dropped in round four. Questions were immediately raised over the length of Mayne's four-year deal and even whether or not he would see out his lucrative contract with the club. It was a difficult way for the 29-year-old and his partner Britt, both West Australian natives who moved across the country just months prior, to begin their life in Victoria. "It was extremely tough," Mayne said. "I think it took until about halfway through the year, when my partner deleted the AFL App, got rid of the papers, got rid of all social media and just stopped listening to the white noise, because that's what it was. "People didn't know my circumstances, my family's, my partner's. Not only was it sucky in a way that I had to deal with it, but the hardest thing was that my mum and dad had to deal with it back home. My partner is here, we had no family and no support in a way." Things have since turned around. Having started the 2018 season in the VFL, Mayne returned to Collingwood's side in round six. That's where he's been ever since, not missing a single game after his inclusion. It's allowed for some normality to return to his life. As well as the AFL Live App. "I've snuck the App back in," Mayne laughed. "I'm a bit of a footy head, so it's hard not to be involved. I want to be a coach when I'm done, so hopefully I'm going to be part of the industry for a very long time. "But I take everything with a bit more of a grain of salt now. It is what it is and all I can do is control what I can control. That's hard work and being a part of this great club." Now a regular in the Collingwood side once again – and back playing finals footy for the first time since 2015 – Mayne owes his partner the holiday they didn't get last year. That will come after they get married this summer, with Mayne reiterating that his on-field success is as much down to her dedication as it is to his. "It's been a great reward for myself and Britt that our hard work has paid off," Mayne said. "She's just been amazing. I'm very lucky to have her, as most people would say about their partners, but I truly am. She's helped me be not only the best person I can be, but also the best player I can be. "It's been great, it can get even better, and that's what we're aiming for. I've not really listened to outside noise or paid attention to social media and I'll keep doing that for the rest of my career."